In school gardens, there is destiny. Peter McCrohan, whose family goes back many generations in Princeton, told me an interesting story yesterday. Not long ago, he went to his 40th class reunion at Princeton High School, and was surprised by how many of his classmates had gone into agriculture and other plant-related pursuits. Turned out they were able to track their interest in plants back to Miss Compton, who taught 1st through 5th grades at Nassau Elementary. Where now there is a university parking lot, there once was a schoolyard that included garden plots in which the kids grew radishes, peanuts and many other vegetables. My lifelong interest in plants owes much to a 3 X 8 foot garden plot I planted in our backyard while in high school. 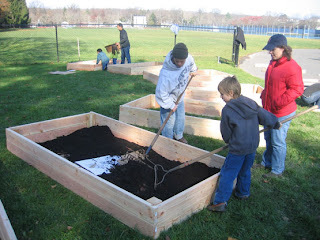 The plot was divided up into squares into which I planted seeds of radishes, carrots, peas, cucumbers... Since I had never seen any of these plants growing before, each new leaf was a revelation. That garden's long gone, but its legacy remains. The raised beds in the photo were built and installed at Princeton High School last November as part of a project initiated by PHS teacher Matt Wilkinson (center), with a great deal of help from Karla Cook and many, many other volunteers. Thanks to Rob Olszewski (right) of Westerly Road Church and a hardy group of teens who came to Mountain Lakes to help remove invasive species from the preserve on March 21. Andrew Thornton (on the left) helped me supervise. As we worked, using loppers to cut exotic honeysuckle shrubs and multiflora rose growing beneath a grove of walnut trees, some of the kids mistook the word "lopper" for "Whopper". Turned out they were all in the midst of a 30 hour fast, in order to better understand the plight of the more than 1 billion people worldwide who don't have enough to eat. The weekend event was part of a national effort by World Vision to raise awareness and funds to reduce world hunger. After a couple hours of productive work, we hiked over to Mountain Lakes House, to see the lakes, the native plants that have overwintered in the greenhouse, and a new trail built around the many trees felled by the recent windstorm. 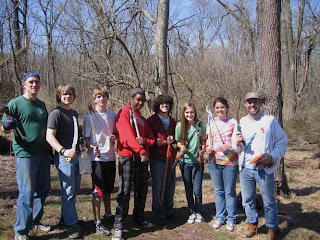 The kids showed a great work ethic and interest in the restoration efforts at the preserve. Someone forgot to take photos of a March 18 workday after school at Little Brook Elementary, during which Martha Kirby, the school's science teacher, parents and kids began restoring habitat along the nature trail. The only visual that made it into my camera is of this "live stake" of elderberry planted next to Little Brook's little brook. 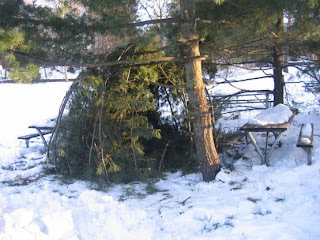 The school's woodlot is a spectacular mess after the storm. One parent cleared trails with a chain saw while the rest of us cut back invasive multiflora rose and honeysuckle. 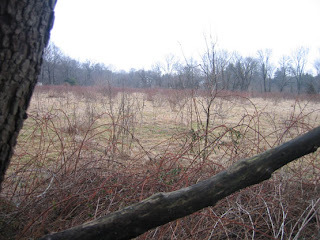 As is common in Princeton's woodlots, most of the trees are (or were, given the storm's devastation) native, but the shrub and herbaceous layers are nearly all exotic. 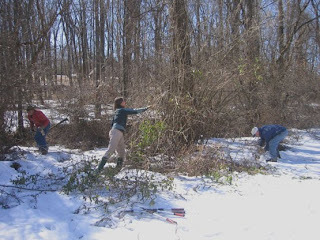 Only a few native spicebush can be found, along with some black raspberries, and the one native elderberry bush, from which we cut two-foot long stems that will sprout roots and leaves if pushed deep into wet ground. Two hours later, the trails were mostly cleared and the balance of vegetation was shifted a few degrees in the native direction. 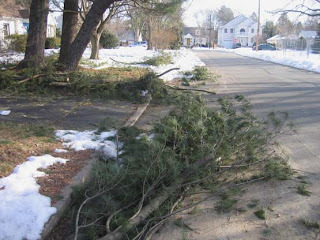 The March 13 wind storm packed a one-two punch. Heavy rain softened the ground, then gusty winds swept through, creating a scene more like the aftermath of dozens of miniature tornadoes. 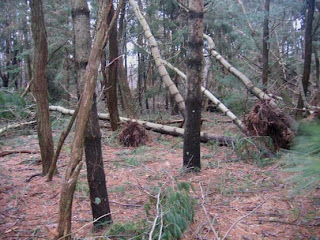 Two pine tree plantations, one on county property near the Mountain Lakes House, the other at Community Park North, underwent a radical thinning, as trees fell like dominoes. I counted roughly 100 trees down in this one patch alone near Mountain Lakes House. One activity I hope to do with my daughter is walk the length of one of these fallen pines, counting the whorls of branches. Each whorl equals one year. A rough count came to fifty years, which would put their planting around 1960. The narrow grove of pines was particularly vulnerable, poised at the edge of this Tusculum meadow. The wind swept across this field and hit the trees with full force. The damage is not all negative. 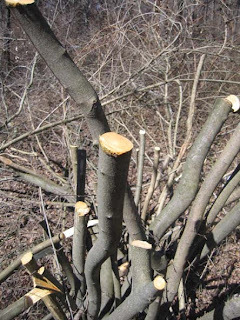 Some fallen black locusts may prove useful for bridge building, since their wood is so rot resistant. The pine forest, though pleasing to walk through, was in many ways a sterile, artificial woods--trees planted in rows with nothing growing beneath them other than exotic garlic mustard and thousands of ash seedlings. All the new openings in the woods throughout Princeton will power new growth at ground level, hopefully of native species that previously had few sunny places to grow. High schoolers on lunch break will have to seek elsewhere for shade. The grounds of the Princeton High School lost a venerable landmark recently (my teenage daughter thinks it was cut down before the windstorm hit two days ago). The rings were surprisingly easy to count--75. That puts its planting date around 1935, during the Great Depression, a time when much of Princeton was open farmland. 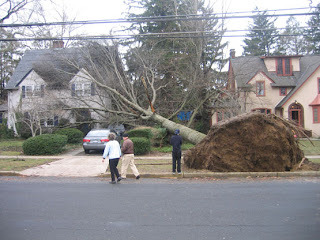 Across Moore Street, a similarly sized tree was pushed over by the wind, leaving a four foot deep hole where the roots had been. The house looked in pretty good shape, all things considered, but I imagine the roof of an SUV is harder to touch up with a few new shingles. Another house, on Murray Ave, also sustained a direct hit from a very big tree, but apparently suffered even less damage. The multiple trunks must have spread out the impact, and landed on the house in such a way that not even a window was broken. More often, the story was of near misses. 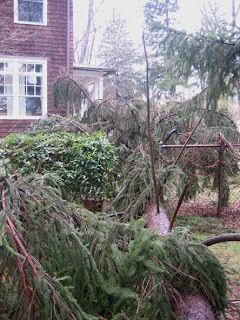 This spruce, guided on a precision route by happenstance, only grazed the gutter of the house, and fell through the fence in such a way that only the gate needs to be replaced. The missing link is missing no longer. 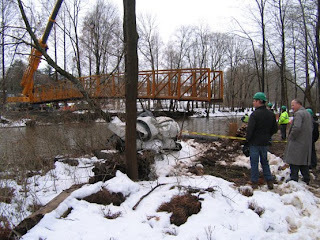 A pedestrian bridge was recently installed across the Stony Brook near 206, just behind the Hun School, filling in a key gap in a trail planned to eventually completely encircle Princeton. Having attended some of the Friends of Princeton Open Space meetings where Helmut Schwab and others gave updates on their efforts to realize a circum-Princeton trail, I can attest to the extraordinary passion and persistence needed to make such dreams a reality. Helmut's history of the effort, copied below, provides insight into the quiet heroics of community volunteers, without which most of Princeton's greenspace and trails would not exist. Funding for the bridge was primarily through a $500,000 grant from the Army Corps of Engineers. (Photo and text from Helmut:) Late in 1993, when I was an active member of the Friends of Princeton Open Space, our work on preserving the Institute Lands appeared successful. We now had a string of wonderful open spaces in our community – Mountain Lakes, Community Park North, the Petoranello Gardens, the not-yet protected Coventry Farm, the later Greenway Meadows Park, some land along the Stony Brook – but nobody knew quite where – the soon expected Institute Lands, and the very long Tow Path leading around the south of our communities. All were disconnected from each other. Furthermore, the State of New Jersey actively supported “transportation enhancements” away from road traffic. A new Loop Trail around Princeton with a bridge connection would allow for bicycle and pedestrian greenway access of downtown facilities – Township Hall, Community Park North sports fields, and several schools – to the inhabitants of the Western sections of town. Other communities in the country pursued the idea of greenways – possibly along old railway tracks. We realized that we had a short abandoned piece of the former trolley tracks leading past Elm Court to a former Stony Brook bridge. We therefore formed a Princeton Greenways Committee with the members: Ronald Berlin, Karen Cotton, Elizabeth Hutter, Helmut Schwab (chair), Edward Thomas, Robert von Zumbusch. After Helmut Schwab retired from the FOPOS Board, Ted Thomas assumed the active management of all trail activities, including lots of trail improvements. Each committee member assumed the responsibility to explore one sector of the Princetons for the possibility to establish greenway connections – walking or biking trails remote from traffic and along vegetative corridors. Our work culminated in our FOPOS committee report of April, 1995: "Linking Princeton Open Spaces". A trail map for Princeton was drawn, accepted in the Master Plan, and still valid – including new trail additions. Ron Berlin had been responsible for scouting out detail opportunities in the south-west sector, which he summarized on page 37 of that report. This includes the words "The Loop Greenway follows the course of Stony Brook until crossing to the west bank of the brook over a future foot bridge, (where) it reaches the Jasna Polana property". This led to the production of the brochure "The Missing Link" in 1997 and a massive fund-raising effort in the late 90ies, mainly seeking grants with the help of political support (see the brochure "Transportation Enhancements" done by DOT under Governor Whitman). At one point, Prof. Billington of PU had his students produce three model designs for the needed bridge to close the Missing Link! We produced a wonderful video demonstrating the need to resolve the Missing Link!! (Wendy Mager was the speaker). Some copies of that video are still around. In 2001, Bob Kiser's Township Engineering Department produced the excellent brochure "Stony Brook Bridge". As the grant money came in, the detail feasibility and environmental studies began. This led to the need for "handicapped access" -- which required switch-backs in the otherwise steep trail approach to the bridge. It took another couple of year to acquire the Clemow property to provide room for the needed trail switch-backs. The environmental studies were done by late 2009. By that time, all the delays and inflation let the grant funds appear inadequate. But then the financial downturn set in. To our surprise, our now issued request for quotes by bridge construction companies brought surprisingly lower prices, within our means! Bridge construction could now start swiftly in early 2010! 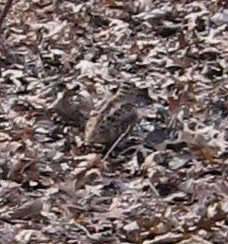 I was startled by a woodcock a few days ago, when it flew up just a few feet away from me. It flew only twenty feet, though, before disappearing into the leafy background of the forest floor. I stopped what I was doing and stalked the bird, my point-and-shoot camera ready but hardly up to the task of capturing my prey. The scarcity of birds on this website has a lot to do with their being equipped with wings and legs. The best that can be said about my aging Canon Powershot is that it represents nature as it's experienced in the field. 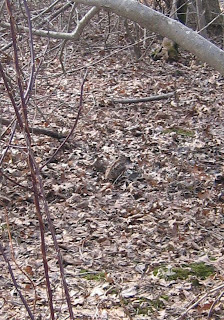 So it's time to test your visual acuity in a game of Find the Woodcock in the Leaves. There was a nice piece on NPR three years ago about the woodcock's mating flight, which can be witnessed in fields around Princeton at dusk this time of year. The meadows at Tusculum, which adjoins Mountain Lakes, might be a good bet. It's a time of sleeping promise at Mountain Lakes Preserve. I'm not up on plant medicines, but if one's optimism is being beaten down by the world, flower buds on a spicebush can be a salve. Those buds tell of flowers to come, and also lipid-rich berries that will help birds get where they need to go this coming fall. 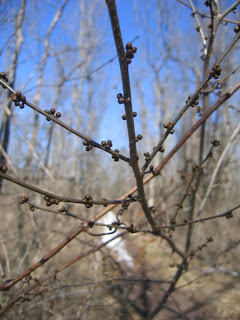 The abundance of buds on this stem owes to the direct sunlight this particular shrub gets during the summer, next to a sewer right of way that's kept clear of trees. The productivity of a nature preserve must be judged not only by its trees, but also by whether enough sunlight is getting through to sustain healthy shrub and herbaceous layers closer to the ground. One participant in our nature walk last week pointed out that spicebush can be identified in winter by using a scratch and sniff test. Scratch the stem and smell the spicy aroma. The many spicebushes in the preserve serve as historians, always ready to tell their story to anyone with the relevant reading skills. 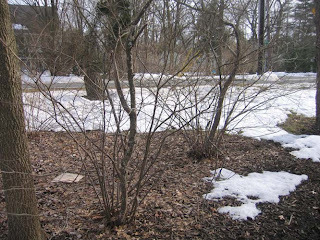 Each of the two shrubs in the photo have a single large stem surrounded by many smaller ones. The large stems predate the explosion in the deer population that peaked about ten years ago. During those years when deer numbers were very high, the deer were so desperate for food that they would eat new spicebush sprouts to the ground each winter. Only the old stems, tall enough to be out of reach, allowed the spicebush to survive. Since the township began bringing deer numbers back into ecological balance, new sprouts have been able to grow to maturity, producing berries needed by wildlife. Once new stems grow tall, a shrub will often allow its old stem to die, its function as a lifeline through hard times done. 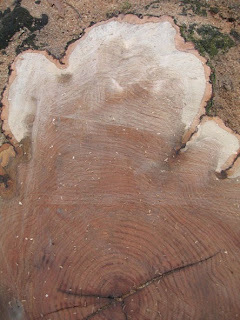 Counting the growth rings of one of the younger stems would likely reveal when browsing pressure began to drop. During yesterday's walk, we stopped to help out one of the few native hazelnuts in the preserve. Andrew (left) is cutting exotic Photinia shrubs while Annarie and Clark cut Japanese honeysuckle and Asian bittersweet vines off the hazelnut. We left one vine growing--a native grape that bears large, delicious grapes in the fall. Though some might be skeptical, it is enormously satisfying to do invasive plant control in the winter, while nature is asleep. We function in the woods much like dreams do in the sleeping mind, relieving stress so that when nature awakes in the spring it finds itself mended. 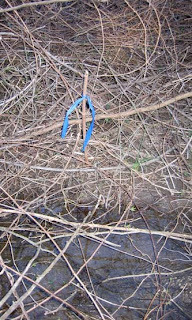 I used to follow the rule that one should bend down and cut stems of invasive shrubs to the ground, but as I get older, that rule becomes a very attractive one to break. The freshly cut stems are treated with a dab of glyphosate to prevent regrowth. 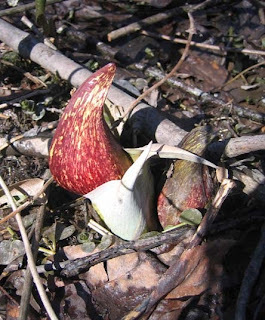 Foundation plantings in town may feature crocuses just starting to bloom, but out in low-lying woods, it's skunk cabbage that has sent up its hooded flower. It's not every day that stalactites grow in a town park. 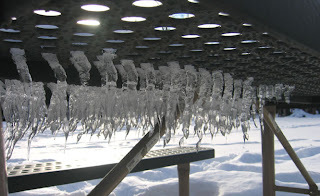 If any toddlers toddled in to the deep snow in Potts Park recently, they might have taken a liking to these mass-produced icicles underneath a picnic table. 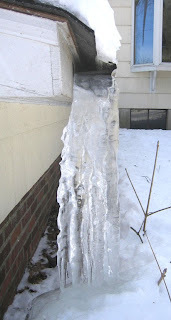 My summer fountain, which runs whenever there's a rain, turned into a frozen waterfall as snow slowly melted from the roof. 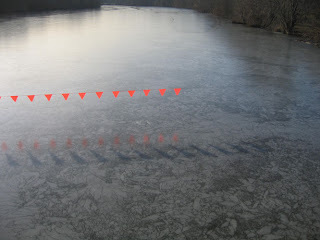 The third variation is the standard version of an icicle, whose reflection is visible on the window in the upper right corner of the photo. Walking over the Harrison Street bridge one day in late January, before the big snows, I happened to look down and noticed that Carnegie Lake had become one giant horizontal, black and white stained glass window. 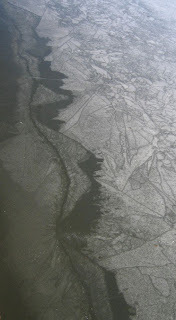 I hadn't kept track of the weather, so can't begin to speculate on what forces might have formed such elaborate patterns. 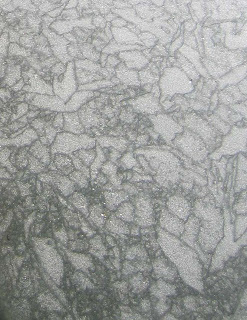 This closeup gives the best comparison to stained glass patterns, including a shape that could be taken for a flower in the upper left. The weight of recent snows took a heavy toll on the branches of white pines, which could be seen scattered on the ground all over town. Though some pines that grow further south, such as loblolly and shortleaf pines, are self-pruning, white pines only get pruned by people or ice and snow. 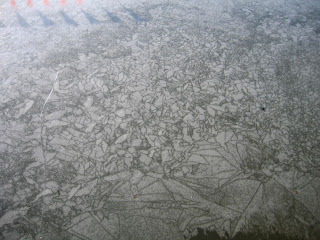 The scars of ice and snowstorms present and past can be found by looking up the trunk. Looks like some kids decided the fallen branches would make a neat little shelter at Quarry Park in the borough, though closer inspection suggests that not all the branches fell naturally. It's nice that some stubs were left--useful for (resiny) climbing. 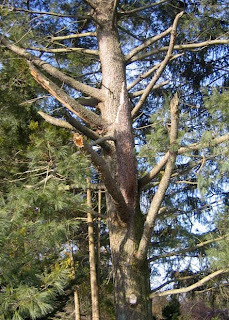 White pines can be identified by their clusters of five needles (other common species have two or three per cluster), and also the way their branches come out in whorls along the trunk. One whorl is produced each year. Count the whorls and you have the age of the tree. Back in my twenties, when my argument with the world was about the very foundations of our culture, I often thought of nature as a work of art (the Mona Lisa always came to mind) that was being defaced by freeways and other human impositions on the landscape. It was surprising to hear people speak of nature as chaotic. They saw plants springing up helter skelter in the woods, while I saw a sophisticated order, with each species adapted to a particular niche. Red maples, for instance, weren't just growing anywhere in the woods. 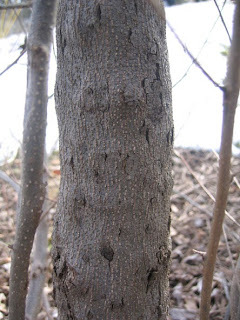 They were typically in low wet areas, turning floodplains into a haze of red in the early spring, while sugar maples thrived on higher ground. Soil, sunlight, water, slope--all helped determine what would be found growing where. The order and synchrony were there to be found by anyone with the patience to learn and observe. 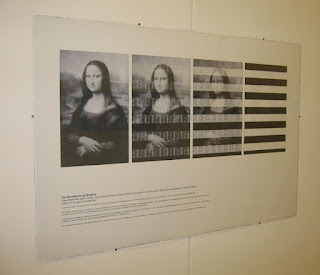 I recently found this sequence of photos in the hallway at the Princeton University's Friends Center. Listed in the credits are J. Alex Halderman and others at the Center for Information Technology Policy. Though the purpose of the sequence is to show how computer data lingers for seconds or minutes after a computer is turned off--something called "memory remanence"--it accurately portrays the status of landscapes as their natural order and ecological balance is slowly undermined by development, invasive species introduction, heavy deer browsing pressure and any number of other impacts. Habitat restoration is in some ways like art restoration, removing the accumulated glaze of exotic species so that the hidden remnants of a pre-existing balance can rebound. With time, some of the original colors will come back into view. At Mountain Lakes, this will be seen early this spring as spicebush gives a soft yellow hue to areas where it was formerly being eaten to the ground or shaded out by exotic shrubs. There is, too, an analogy with digital photography. The sparse understory of most any woods appears pixelated these days to anyone with a memory of the rich, diverse array of wildflowers that once carpeted the ground. Though the woods still appears green, the patterns of a healthy order have sometimes faded beyond recognition.